Round by Round: Rocky Juarez-Juan Carlos Ramirez. 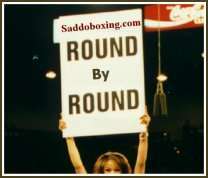 Home / Round by Round / Round by Round: Rocky Juarez-Juan Carlos Ramirez. As it happened, only one round was necessary to report in this main event as Rocky Juarez made quick work of Juan Carlos Ramirez. Here is what happened in this latest explosive performance from Rocky Juarez. it, sending Ramirez sprawling to the canvas. Ramirez gets up and a short time later, the same thing happens, but this time Ramirez just crumples to the canvas. Ramirez gets back up but Juarez can smell blood and gets Ramirez on the ropes. Juarez lands a hard left hook to the jaw and Ramirez looks hurt again. Juarez misses a few punches with a right grazing Ramirez who then goes down at the bell. The referee waves it off. Juarez WKO1 2:59 of round one. Previous Round by Round: Cruz Carbajal-Jorge Lacierva.